This is the first of two articles looking at the high and lows of the July ’18 results from the Institute of Customer Service. You can download the Executive summary here. For a quick skim read of the key takeaways, just read the headers and you’ll be good to go! The numbers. The overall index is 77.9, down 0.3 on this time last year from the joint highest score with Jan ’13 of 78.2. Of the key customer measures, trust and customer effort remain the same. However the number of customer experiencing a problem has positively decreased (from 13.1% to 12.8%) whilst the number of customer experience that are right first time has declined from 80.7% to 78.7%. Despite overall satisfaction decreasing, Net Promoter has increased by 1.3 to 18.3. 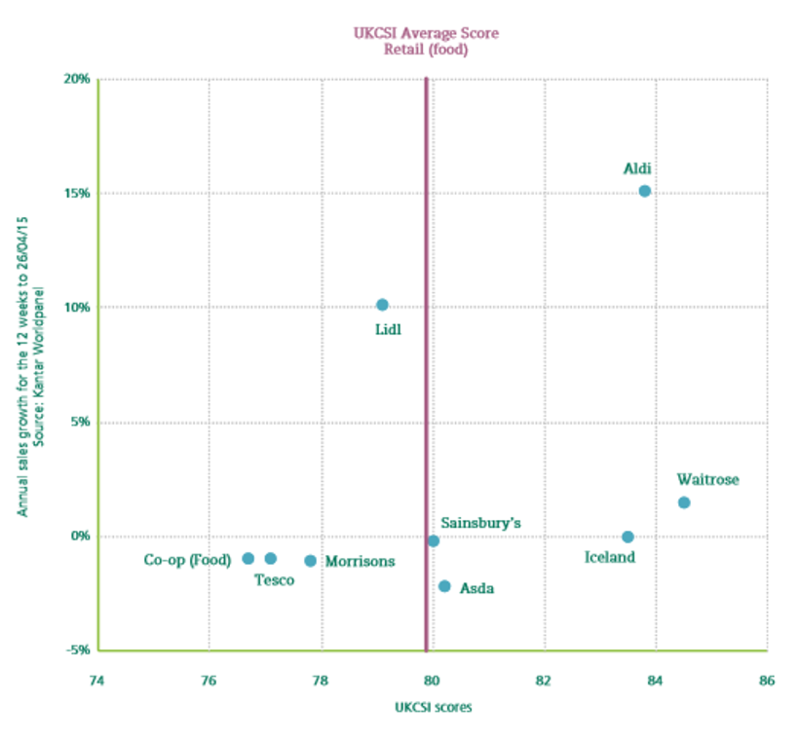 Consistently at the top of the table, Retail (non Food) has a CSAT index of 82.1 and an NPS score of 40.5, with both scores being well above average. Bottom of the table comes Transport with an index of 72.5, having declined from July ’17, whilst for NPS, that position is reserved for Utilities with -4.9 highlighting the gulf in recommendation between highest and lowest performing sectors. 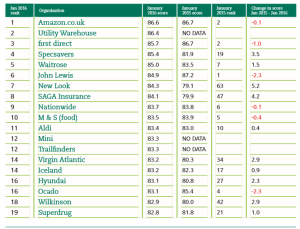 Amazon retain their first place from last year with an index of 86.7, followed closely by John Lewis at 87.5. Two companies tie for joint third on 86.1; Next and Yorkshire Bank, with the bank rocketing up the table from 103 this time last year. First Direct and Nationwide tie for joint fifth on 85.6 with First Direct down from their second place last year. Not surprisingly, Yorkshire Bank, Trivago and Jaguar have the largest increases in satisfaction. Bringing up the rear of the top 50 companies (only published in the free report from the UKCSI) is Toby Carvery at 81.2 and joint 48th. However to give them their just deserves, they were 106th last year! No utilities companies now reside inside the top 50. 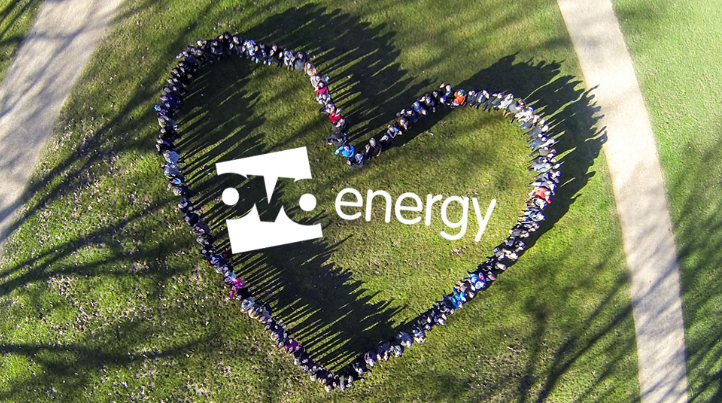 Ovo Energy sit just outside at 81, down from their 42nd place at 81.8 last year. 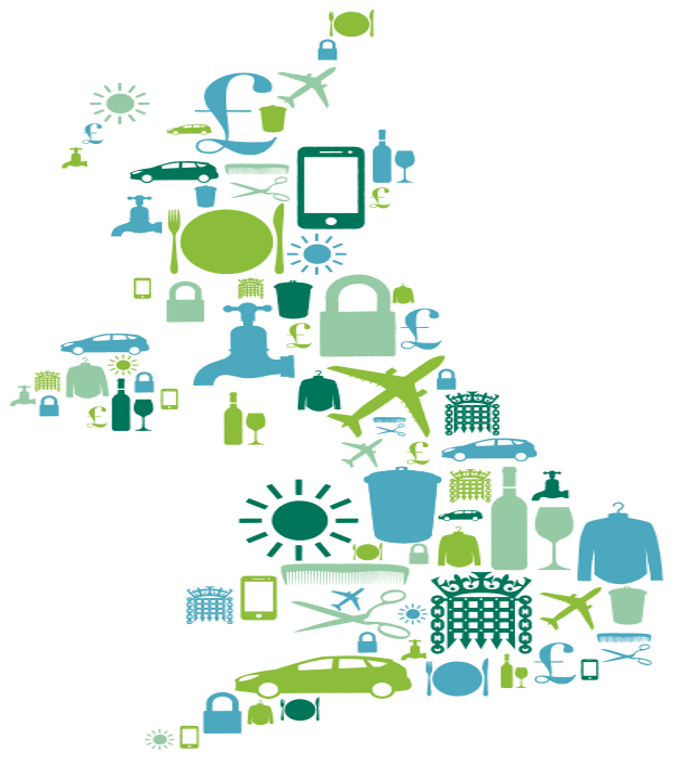 There are 4 new entrants to the UKCSI; Great Northern, Dacia, Virgin Money and South East Water. High performing organisation also have higher percentages of right first time experiences (88.2 vs 79.4), lower problems experienced (9.1 vs. 12.5) and higher complaint handling satisfaction (7.1 vs 5.7). This also suggest that customers expect problems rather than expect perfection but they way in which they’re handled is critical to avoid them impacting customer satisfaction. Whilst priorities vary by sector, making it easy to contact and better website dominate as a theme across most sectors. 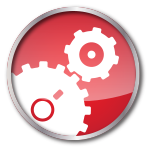 If you want to discuss anything mentioned here further, or want to know how we can help you improve your organisation’s customer experience to reap more business results then please get in touch. I was recently invited to take part in a round table conversation on the subject of delivering great customer service. It probably goes without saying that I’m a massive fan of any organisation who looks to learn more about their customers with a view to improving their customer experience. They’ve a unique challenge when it comes to customers though as unless you’ve experienced a power cut, or requested a new connection in a property – you’ve most likely never heard of them! In a perfect world, they maintain supply, sit quietly in the background and do what they need to, to maintain the network supply. It’s more than likely, most people won’t be able to articulate who they are and what they do which is where their challenge arises. Engaging and delivering a service to customers who don’t know who they are, and why they’re there is difficult. In the event of a power cut, people just want their supply restored in as fast a time as possible, and that’s stressful for everyone including NPG who are already on the back foot in a situation like that – if it’s not a planned outage. I’ve worked with a number of utility businesses including Southern Water who were able to boost customer engagement by, of all things, inviting customers to one of their water treatment works! Apparently, once customers understand the amount of work and effort that goes into cleaning and recycling their water, it shifts customers’ appreciation of what’s involved and, more importantly what their bills contribute towards. However, NPG are investing time and effort to understand what customers want – both consumer and business and to work towards improving on what good work they already do. I’m for one keen to keep a track on their progress. Good luck to them! 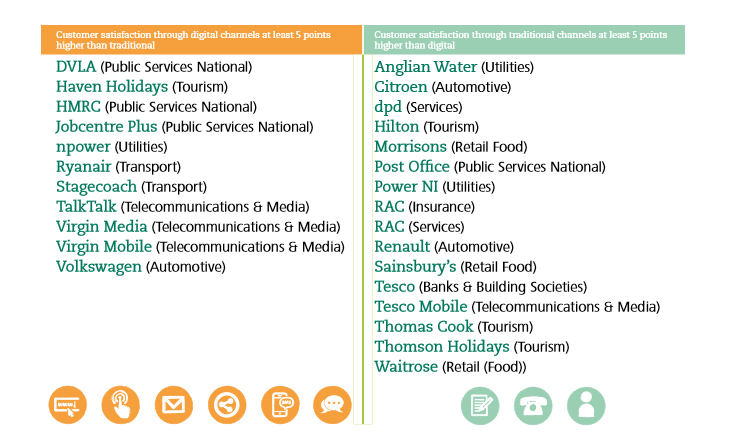 In the final bite size post around the latest UKCSI from the July results, we’re going to look at the use of and satisfaction with both digital and traditional channel preferences from a customer perspective and some of the key takeaways for organisational learning. 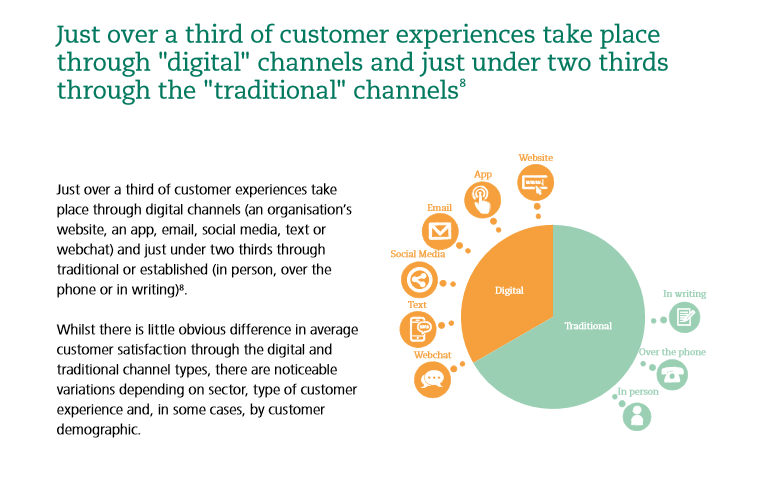 Just over a third (36%) of all customer experience take place through a digital channel (web, email, chat, text, app or social media) with the remaining 64% through traditional channels (face to face, phone or writing). Satisfaction between digital and traditional is broadly similar, 77.8 for digital and 78.5 for traditional. However, there are more notable differences when looking across sectors. Out of 13 sectors, only Utilities and Tourism show over 50% digital channel preference by customers (52.9% and 66.3% respectively). 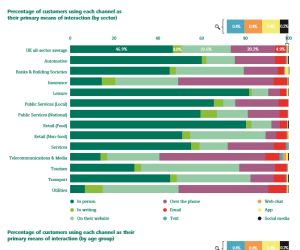 The least digitally adopted customer experience sectors are Retail (Food) at 16.6%, Public services local at 17%, national at 21.8% and Leisure at 18.5%. Digital continues to be both an opportunity and a challenge for public services with the ongoing cost pressures they face whilst trying to maintain and improve the customer experience. Demographics within a local authority, access to the internet and the complexity of individual circumstances continue to be barriers in service transformation that we at Custerian see directly with public sector clients. Optimised, blended solutions supported by efficient and effective processes, delivered through engaged employees seem to be the way forward. Does task make a difference to channel or satisfaction? One key takeaway around channel is that preference doesn’t necessarily lead to higher satisfaction and that customers use channel for different purposes. 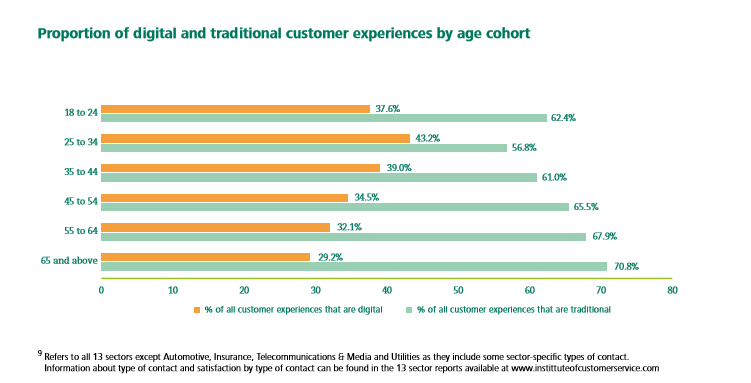 Digital takes preference for enquiries with 21.6% of customers versus 12.9% traditional channels but with lower levels of satisfaction for digital (74.1 vs. 77.7). For purchase, traditional trumps digital at 46.8% versus 39.4%, however here digital has marginally higher customer satisfaction levels (80.3 vs. 80.1). Is digital all about the youth? Whilst the general perception is that digital is dominated by youth, the real usage of the channel is more broadly spread. Interestingly, when you look into digital channel usage by gender, women use email as a higher usage channel than men (9.9% vs. 6.7%) and use it 53.6% of the time when making an enquiry vs. only 30.6% by men. However again, channel preference doesn’t guarantee satisfaction. Despite the higher adoption of email use by women, they’re less satisfied when compared to men which bucks the overall trend as women are generally more satisfied than men. The final key takeaway is that there definitely seems to be different strategies within organisations to a digital vs. traditional channel approach from the results. However what is clear is the need for consistency across channels in terms of customer experiences, allowing customers their preference of choice. This closes out our series of 3 mini blogs on the July ’17 UKCSI results. We’ll continue to keep a keen eye on the numbers as we progress through what could economically and politically be a very disruptive remaining 6 months of 2017, not to mention the continued expansion of digital and technology advances and adoption, which if delivered well by organisations should create better, more integrated and friction less customer experience. Here’s to progress! This is our 2nd of 3 posts about the most recent UKCSI results. This post focuses on the problems and complaints findings from the report and is expanded on, to show the wider impact to organisations which is the real elephant in the room that’s not being addressed. This is less about the report results per say, but more a reflection on organisational behaviour that needs to, but has yet to significantly change. Let’s start with the numbers first though. Improved complaints handing has contributed to the improvement in the customer satisfaction index over recent years. 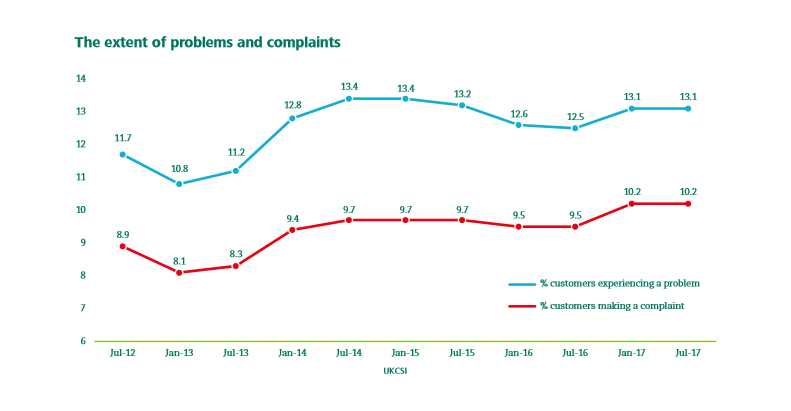 However the volume of complaints is back to the level that it was at in 2015 when overall satisfaction was at its lowest. 13.1% of customer experienced a problem as indicated in the July 17 report, compared to only 10.2% of customers who actually made a complaint following a problem, albeit this is the highest percentage it’s ever been. If this was extrapolated out as a percentage of the working population (based on ONS working population data) then that’s 5 million people complaining in the last 6 months alone. In addition, the percentage of escalated complaints for non-resolution is also up from 41.4% to 48.6%. Retail, Public Services and Leisure are the three sectors seeing the highest number of escalated complaints with a year on year average increase of 11%. Availability of goods/services account for 75.2% of complaint escalations with quality/reliability of goods/services being the most cited reason for a problem. More problems being actively followed up by organisations with customers, to ensure they have been resolved. However, year on year the increase in customer satisfaction is only up 0.5 to a whopping 5.7 out of 10! This seems like a lot of effort for very little return. I’m not suggesting to not try and improve complaint handling but surely there’s a wider, bigger point to address? So where’s the elephant then exactly? From ICS’s own research, they indicate that on average there are 2.8 contacts between a customer and an organisation on a complaint, which rises to 3+ when a complaint isn’t resolved. 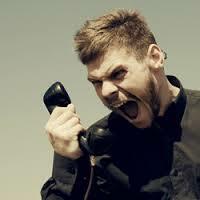 70% of these contacts they also state, are by phone, generating an estimated 9.9 million additional telephone calls. An additional 9.9 million calls then costs on average £35,145,000 in unnecessary and probably avoidable cost to organisations and bear in mind this has been increasing year on year, every year for the last 8 years! In lean six sigma terms this is waste. A lot of waste. Waste that can be identified and eliminated to improve not just the customer experience and their levels of satisfaction, but an increase and optimisation in internal efficiency and effectiveness. This cost of handling additional contacts doesn’t even take into account the cost of reputational damage to organisations, lack of consumer confidence and trust (transparency and fairness) and business that has gone to competitors that could have stayed in place. Why waste time and money trying to get better at something, when you could eliminate the need to improve by getting rid of the problem that caused the complaint? Is it me or am I missing something? 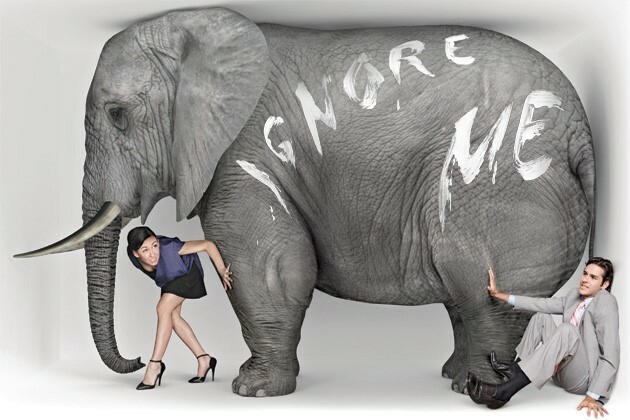 The elephant in the room is that the specific causes and sources of problems aren’t being addressed and fixed. Instead, organisations seem to be getting (marginally) better at handling complaints, rather than eliminating the root causes. Now you could argue that as customer expectation is constantly on the increase, the customers are more demanding than ever before and so are less tolerant of poor and average performance and that is in part correct. But at The Customer Experience Coach, born out of our own experience, we see it time and time again. We see it within almost every organisation we work with. We also see it in our design thinking workshops when we get people to the point of clarity on what’s the real problem they’re trying to solve by making a change or driving new innovation. You can literally see the light bulb moment appear on the faces of the people we share design thinking with who come to the realisation that for years they’ve been throwing solutions at problems that they don’t truly understand. The resulting situations are unnecessary, costly and resource heavy projects that either fail completely, or fail to deliver the solution because nobody took the time to understand what the exact problem was that they were trying to solve in the first place. And so this is why organisations try to get better at handling complaints because the alternative appears to be too big, too messy to untangle and needs a collaborative approach to solving problems and most organisations aren’t in that space. Ever heard the phrase “it’s like rearranging deck chairs on the titanic”. Something that’s easy to do but ultimately futile. It makes people look busy and they think they’re making a difference but really? This isn’t a criticism, more an observation on reality. Organisations aren’t going to make a significant dent on complaints if they’re not prepared to really look at the root causes and fix the real specific problems rather than the imagined ones. The same goes for design thinking. If you design a solution for a poorly defined problem then you’re not going to solve the problem. So if this situation resonates with you on any level and you’d like to discuss any of the issues or challenges mentioned then please get in touch. 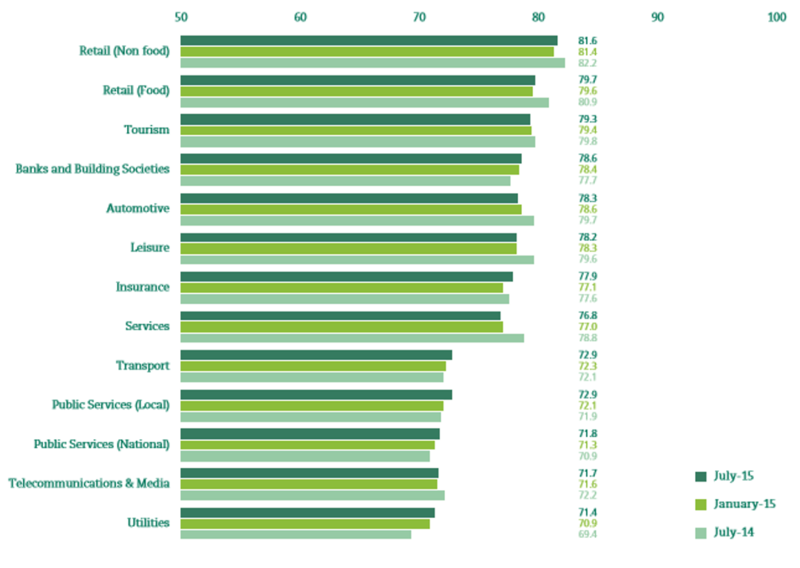 In a series of bite size articles, this being the first, we’re going to explore the findings from the latest UK Customer Satisfaction Index results from the Institute of Customer Services. This first piece covers the high level results, sector performance, key differentiators and loyalty. The following articles look at the impact of problems and complaints and the final part looks at channel preference and usage by customers. The overall index is back to its highest point ever, in the UKCSI’s 8 year history, last seen in 2013 at 78.2, up 0.8 year on year (from 77.4) amidst the turbulent back drop of a recent election and the continued Brexit discussions. Improvements in satisfaction with complaint handing seem to be the significant driver of moving the overall index. 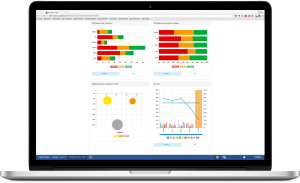 However the number of customers indicating problems with organisation is on the increase which suggests a lack of root cause elimination of the causes of customer problems. Something we’ll discuss in more detail in the next post. Average NPS is slightly up by 1.3 to 17 compared to this time last year but down by a massive 5.2 points from 22.2 in 2013. The average level of trust is unchanged year on year (at 7.7 out of 10) but customer effort has increased (+0.2 to 4.9), meaning customers are finding it more difficult to deal with organisations to get what they need. 6 sectors have increased by more than one point, and interestingly these include public services and utilities. Of the 245 organisations in the CSI, 63 increased their score by over two point whilst 29 organisations fell by the same amount. 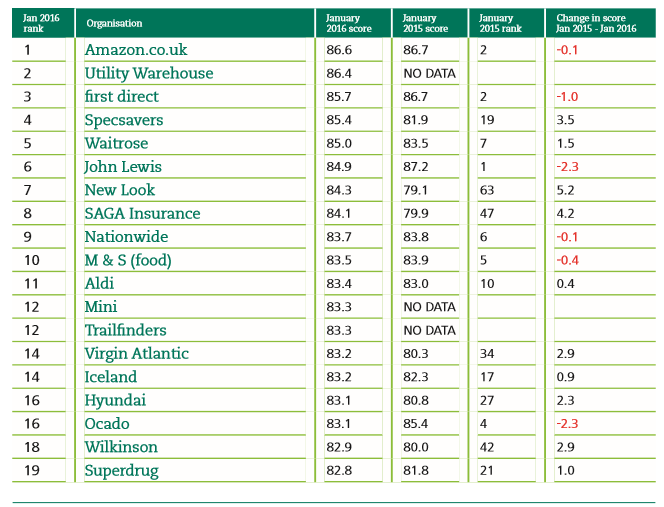 Of the 20 most improved organisations, 8 are utilities (6 water companies and 2 energy) and 5 are train operating companies driven in part by the desire from the regulator for better customer experiences. The usual suspects lead the league table; Amazon take top spot with 87, followed by first direct on 85.8 and John Lewis on 85.4. Jet 2 Holidays are in the CSI for the first time and have come straight in at 4th place with a score of 84.8. The largest year on year increase in satisfaction at 6 points is M&S (financial services), with the largest decrease seen by Iceland at 1.9, dropping their position from 16th last year to joint 47th this year. So what’s different about the top 50 from the rest? Apart from year on year consistency overall, complaints handling, phone experiences and getting things right first time are the key differentiators. The graphic shows the 3 key differentiators broken down into their respective components and the difference in scores across each. Cleary the top 50 organisations are capable of delivering higher and more consistent performance in these areas. Certainly in respect to the loyalty question the answer is no. However customers are much more discerning and demanding with where they choose to place their loyalty (trust and confidence) than ever before. From the numbers perspective the impact on the difference in loyalty, trust, recommendation and reputation are quite marked between customers who score 8 out of 10, to those who score a 9 or 10 out of 10. That 1 point of difference in score could mean a significant amount in repeat business (or lack of) to an organisation. If you think of all those moments of truth (or interactions) that a customer experiences, there are a lot of opportunities to make a difference and organisations need to both understand and capitalise on them if they’re going to continue to succeed. The graphic shows the difference in percentage terms that 1 point can make. So that’s a roundup of the high level numbers. The next part will focus on problems and complaints results and trends and the real elephant in the room that’s still not being tackled. State of the Nation: UKCSI Jan 2016 results. New Year New Start? The latest results are out and make in the main for encouraging reading. This month, the UKCSI, the national measure of customer satisfaction on the high street has seen an index 2 year high, reversing, for the second consecutive period the previous two year decline we saw between January ‘13 and ‘15. 39,000 customer responses were collated covering 296 organisations, which gave an overall index of 77.0 (out of 100) this month, up 0.8 points compared to July 2015 (76.2) and up one point compared to January 2015 (76.0). However this is still below the all-time high of 78.2 seen in January 2013 so whilst it’s a positive sign, we’re not there yet in terms of customer recovery. However of those 296 organisation, 96 saw an increase, whilst only 44 saw a decrease in results. Utilities as a sector shows the biggest increase with 1.9 points, albeit 12th from 13 sectors overall. Encouraging gains but not out of the woods just yet as 1 of 5 sectors below the average. T-Mobile sees the biggest increase at 9 points over the last twelve month which is a significant shift, a similar performance last seen by Lovefilm in July 2015 with an 8.2 point increase. For the naysayers who still don’t believe that great experiences and high levels of satisfaction drive (financial) results, Food retailers with a UKCSI at least one point higher than the sector average achieved average sales growth of 7.6% compared to a drop in sales of 0.4% for those with a UKCSI at least a point below the sector average. Out of all 13 sectors, apps only provide the highest levels of customer satisfaction in the Bank and Building Societies sectors although it’s unclear how widespread apps are deployed across the other sectors. Most customers (58%) use one channel of communication when they interact with organisations. A sizeable minority say that they use two (34.1%), but then there’s a marked drop off in usage (both overall and across sectors) to three (5.6%) or more than three (2.3%) channels. Customers who used three or more channels were much more likely to say that they had experienced a problem (27.7%) with the organisation in the previous three months and give them a lower customer satisfaction rating. This is 3x higher than those that use 1 channel. I can personally testify to doing this with a company when I didn’t get the results I wanted by email and phone, before taking to twitter to complain. This is all about customer effort. More effort = less satisfaction. 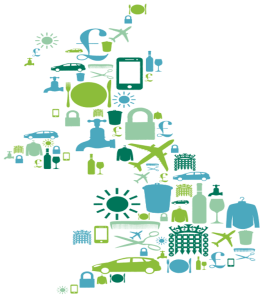 Also at the end of 2015, the UKCSI reviewed the importance of customer priorities which was last reviewed in 2010 and there’s some noticeable changes across the – wait for it, 47 customer priorities. Interestingly, value for money only features at 13th with price/cost at 20th. And finally a word about the most important features of delivering a great customer experience; employees. Employees’ friendliness, helpfulness and competence have become relatively more important in the eyes of customers over the last 5 years, as well as speed of service, especially when dealing with employees in person. Ease of doing business has also increased in importance along the theme of reduced customer effort we’ve discussed over the last 12 months. All in all interesting times and a continuingly changing customer and business landscape where the agile, fleet of foot excel and the legacy industrial monoliths creak and groan. Here’s to a continued improvement and let’s see what the next 6 months brings. Source: UKCSI Executive Summary Results January 2016. The annual customer service survey from Which? is out and the usual suspects feature at both the top and bottom of the list of the 100 big brands rated. You can read the full results here but we’ve summarised the highlights below. The 3,501 general public respondents were also asked to give brands an overall rating for customer service, which is where the customer service score comes from. 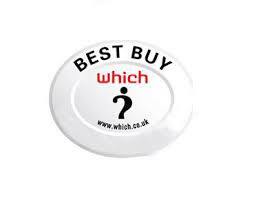 Amazon, M&S, Pets at Home, Waterstones, Dunelm, Clarks and the RAC all made the top 10. Despite being voted Which? supermarket of the year in 2014, Aldi only managed joint 73rd with 14 other brands including Virgin, British Gas and JD Sports all scoring 71%. 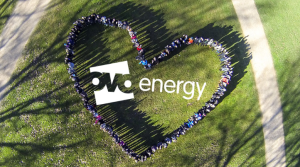 IT aside, these two sectors have done little to visibly improve, with big players losing significant ground and customers to the disruptive likes of Ovo Energy and Ecotricity. If this continues, I wouldn’t be surprised if the respective regulators for these two industries ‘impose’ a change on behalf of customers. Interesting times! Are Digital Marketers Missing A Trick? 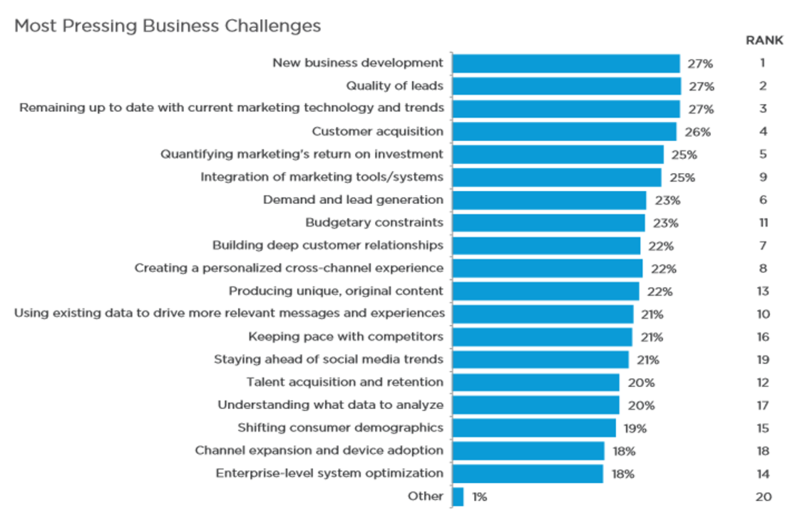 This is according to research conducted globally across 5000 marketing professionals and published in the 2015 State of Marketing by salesforce.com Marketing Cloud. The report goes on to further confirm the focus on digital platforms for marketing and that this year is the ‘definitive’ year for mobile. “For the past 10 years, digital channels and data points have been accumulating at breakneck speed. Every industry has been disrupted. The customer now rules, and speed is the new currency of business. Marketers have scarcely had a moment to make sense of it all with a single big idea that ties everything together. Enter the customer journey. A growing number of marketers today are envisioning their entire marketing strategy under the umbrella of a cohesive customer journey, which we define as all of the interactions a customer has with brands, products, or services across all touchpoints and channels. According to recent research, 86% of senior-level marketers say that it’s absolutely critical or very important to create a cohesive customer journey. 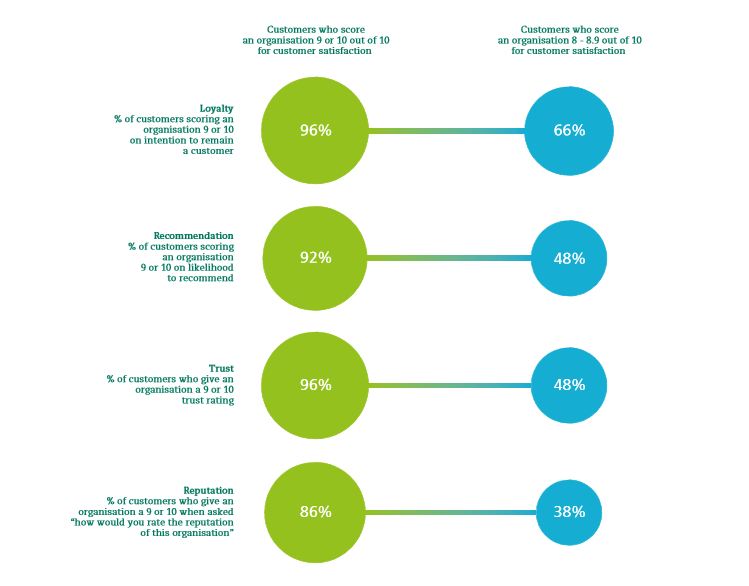 Another 11% view the customer journey as moderately important. So it was at this point that the penny dropped. What about customer retention? Why isn’t this a business challenge? Are 5000 global marketers saying that customer retention is really not a challenge? Arguably, it could sit outside of the top 20 or it could sit within the ‘other’ category at 1% but to me this doesn’t feel right. Now I’m not a marketer I must confess, but this feels like marketing are trying to do what they’ve always done. That is to focus pretty much exclusively on front end customer acquisition, with a sprinkling of a focus on ‘in life’ customer interaction but with little or no focus on customer retention, advocacy and loyalty throughout the customer journey. They’re currently trying to do this by moving away from more traditional marketing tools and instead using lots of sparkly new digital toys without truly understanding new digital, personalised customer habits and trends. As a result, there’s no paradigm shift to a new marketing mind set that sees the total customer lifetime as their responsibility beyond mere acquisition. Now it might be that these 5000 marketers have in their business, someone else responsible for customer retention but surely if this is the case, these should be symbiotically related and so as to share the responsibility of customer retention beyond mere acquisition? It’s more costly just to shovel new customers in at the front end without the opportunity to retain and grow those same customers for life. To further substantiate this point, looking at the top 10 technologies to create a cohesive customer journey, there’s no mention of any Voice of Customer (VoC) technology to provide customer insight into the journey at critical touch points as a way to further inform and improve the customer experience and subsequently the marketing process. 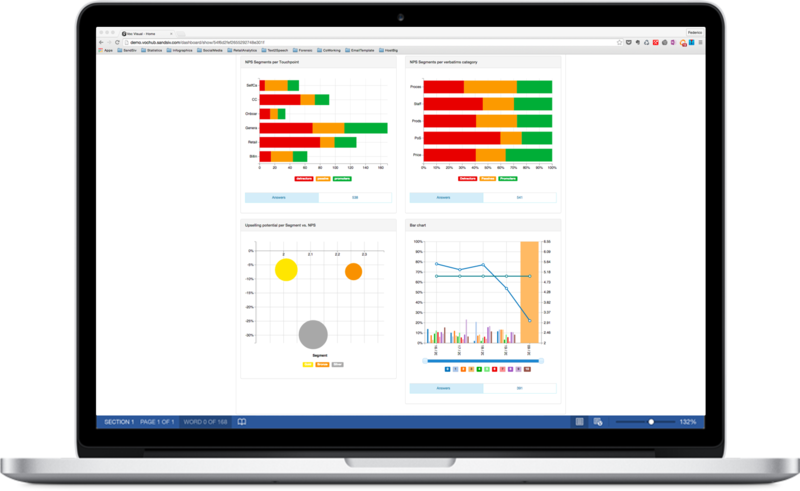 VoC systems such as SandSIV’s VoC Hub are as much an asset to marketing as they are to any other part of the business and marketing are missing a trick if they’re not ‘plugged in’ to, or even considering tools like this to complete the holistic picture of the end to end customer experience. Whilst it shows an increased willingness for marketers to communicate with customers across multiple channels and touch points, the rationale for this is still based on what’s most important to the business first (new customer acquisition), rather than what’s most important to customers. ‘Listen hard and act fast’ as SandSIV would say and include VoC within the marketing mind set and on the technology wish if you want to stay ahead. I recently re watched the inspiring Ted Talk from Simon Sinek on how great leaders inspire. Simon talks about the notion of a golden circle or 3 concentric circles. 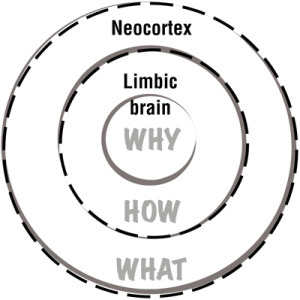 At the centre, is ‘why’ – the emotion or purpose of why you do what you do (or why a business does what it does). Next out is ‘how’ and the outer circle is ‘what’. 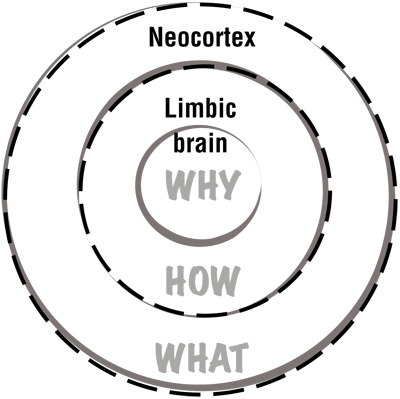 Customers buy from the inside out based on the why first, then how and what. Businesses however, sell and communicate from the outside in which is why they often fail in their approach. They’re very good at telling you what they do and how they do it, but not very articulate (if at all) about why they do what they do. The really important bit that customers really buy and that makes a significant difference between businesses in terms of their success. Therein lies an often over looked paradox in relation to customers and customer experience. Businesses want customers to be loyal. Loyalty, as is commonly known drives recommendation, referral and repeat business (Harvard’s 3Rs model). 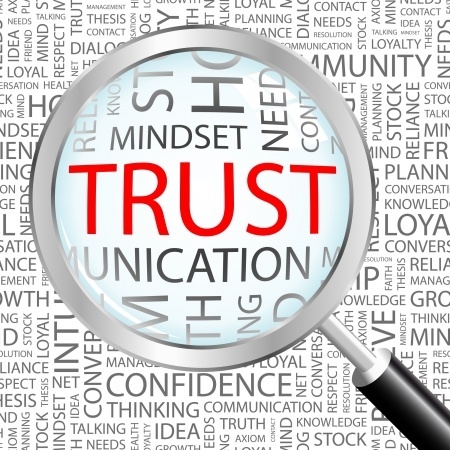 Businesses also want the beholden golden goose of customer trust. The unquestioning kind where customers stay loyal despite challenges and issues because they believe in a brand or business. These appear to be at first glance rational needs (the what and the how) and requirements from a business perspective but they are not. Decisions around loyalty and trust come from emotion (the why). 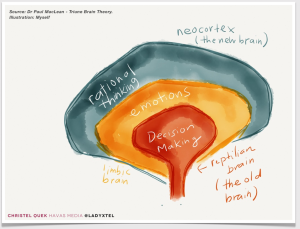 Emotion comes from the very oldest and fastest part our brains (as opposed to the more recent neocortex). It’s a part called the limbic system where arguably our intuition and gut feel also stems from. It’s the part of the brain that drives us towards pleasure and away from pain and pretty much kept us alive in prehistoric times. Customers act loyal (or trust) based on how they feel first then how they think second by rationalising their decisions. Few people realise this as it contradicts the classic economic theory as first mentioned by Adam Smith in his publication The Wealth of Nations. His idea (now largely debunked yet not widely believed) was that we are all rational decision makers most of the time and that we act only in our own self interest, balancing up costs and benefits before making a decision. In fact, the very reverse is true. Most, if not all of the time we are emotional decision makers who then rationalise our decisions to avoid believing we made a bad or poor decision in the first place. We also look for supporting evidence to back up our decisions, so we further believe we made the right choice (see the brilliant book ‘Predictably Irrational by the equally brilliant Dan Ariely). Business (in the main) acts and communicates in the opposing direction to how customers act, by delivering and expecting rational acts (customers buying on features and benefits as an example) to evoke emotion in customers (hopefully positive but often negative!) in order that they’ll buy a product or service. Emotion is always evoked so that’s definitely a successful outcome delivered. However, in the majority of cases it’s apathy from the customer’s perspective (think financial services and products like pensions), or unless you’re Apple, Disney or Zappos who excel at creating positive emotion. Alternatively it’s frustration or anger that’s generated especially if you’re Ryan Air or npower. So there’s a lot to be gained by starting at the ‘why’ in business before moving to the ‘how’ and ‘what’ given that’s how customers function but it’s either not done often enough or it’s not done very well. Starting at the ‘why’ in relation to anything customer related is going to be a more positive experience for everyone involved. ‘Why’ moves people to act. ‘Why’ can be a powerful, purposeful story that evokes unstoppable emotion and that lasts. It also builds trust and loyalty and that’s what customers really want; not features and benefits.